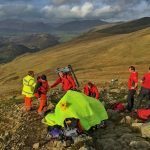 Incident Details: Two 13 year old boys went up Cat Bells, and filled with enthusiasm, decided to see how far they could get before coming down to meet up with parents. They got a long way, (almost to High Spy) but then realised that it was getting dark and misty, and turned round. As they had no torches, the inevitable onset of darkness happened, and they had the sense to stop and call for help before they walked off something steep and nasty. The Team turned out plenty of folk to search the various routes off, but fortunately the SARLOC system worked, and gave a location between Cat Bells and Maiden Moor. They were located fairly swiftly by Search Dog Ginny and Team members, and walked off the hill safely, none the worse for their adventure, but hopefully somewhat wiser. 18 Team members – 2 hours 34 minutes.